Certain destinations have that special something, inspiring dream trips and return visits. Whether it’s their beguiling atmosphere, dramatic landscapes or invigorating culture, these four cities and towns each have their own signature allure that will make you fall in love with traveling all over again. Discover them as part of one of Oceania Cruises' inspiring itineraries. 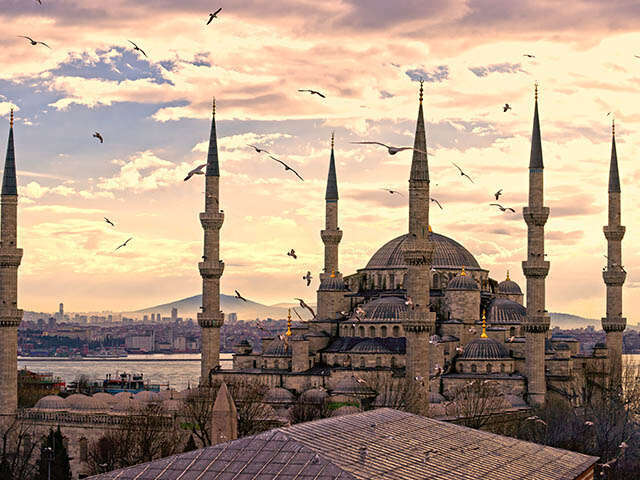 Energetic Istanbul is one of the most exciting cities in the world, with a history and culture so rich that you could spend days exploring and still barely scratch the surface. Inhale the exotic scents at the Spice Bazaar in the Eminonu quarter. Climb to the terrace of Galata Tower to hear the Muslim call to prayer echoing through the streets. Plunk a sugar cube into a glass of tea or thick Turkish coffee. Visit the Turkish and Islamic Arts Museum to see treasures like centuries-old, decorative handwoven carpets. And if you’re lucky enough to be there overnight, revel in the world-class nightlife at Taksim Square. Insider tip: On the Asian side of the Bosphorus, the Neo-Baroque Beylerbeyi Palace has an ornate, twisting staircase and maritime-themed art. The nearby Üskudar neighborhood is less touristy than other parts of Istanbul and with plenty of excellent dining options is perfect for lunch or dinner. Along a crescent-moon like curve in the Garonne River rises the iconic 18th-century architecture of Bordeaux, a brilliant unity of medieval roots, neoclassical style and urban planning so remarkably revitalized that half the city was declared a UNESCO World Heritage site in 2007. Stroll through this divine cityscape defined by its parchment-colored buildings and wide-open squares, the largest of which is the 30-acre Esplanade de Quinconces. The only thing that could draw you outside of a city this gorgeous would be wine regions as revered as Médoc and Saint-Émilion and the elegant countryside chateaux where you can taste these renowned vintages. Insider tip: Contrast Bordeaux’s perfectly unified neoclassical architecture with the ultramodern Cité du Vin, an immersive sensory experience revealing the epic story of wine worldwide – its history, process, culture, aromas, flavors and more. Mother Nature draws enthusiasts to Flåm, and you will find no shortage of ways to experience some of the world’s most awe-inspiring landscapes. Hop a ferry to view the fjords and mountains from sea level or head to a lookout point to see the show from above. Jump on the popular Flåm Railway for a leisurely trip up to 2,800 feet above sea level or ride a zip line for an adrenaline-pumping descent that ends at a local cheese farm. Set off on a bike or on foot to explore the Flåm Valley at your own pace. With a population of 350, Flåm is a speck of a town, but you can shop for warm clothes, not surprisingly, and statues of trolls, Flåm’s mascot. Insider tip: Hop on Flåm Railway, the steepest non-funicular railway in Europe, for spectacular views of glowing emerald valleys, dramatic waterfalls, soaring mountains and plunging fjords on one of the most beautiful train routes in the world. The tiny village of Kodiak clings to the Emerald Isle of Kodiak, which is known for its breathtaking natural beauty. During the summertime, the island is a mosaic of flora that includes wildflowers, moss-laden spruce, Pacific red elder, and blueberries, which the brown bears feast on. Try kayaking through the pristine waters surrounding Near Island and you might spot puffins, sea lions and perhaps even humpback whales. Gain a deeper appreciation of island’s Russian heritage with a visit to the Russian Orthodox church and Baranov Museum, which houses samovars, Alutiiq basketry, archival photographs and other relics from Kodiak’s past. Don’t miss the Alaskan king crab – a favorite – along with salmon fish and chips. Insider tip:A favorite of both locals and travelers, Fort Abercrombie State Park is filled with trails, beaches, vistas – and even bunkers and relics from WWII outposts. Join the Oceania Cruises' excursion, “Fort Abercrombie State Park Nature Walk,” for guided walk led by an insightful park naturalist.